*If you sign up for Airbnb using my referral link you will get you will get a $26 CAD credit for your first trip of $90 CAD or more and I will also get a $26 CAD travel credit when you take your first trip at no extra cost to you. Our two days in London was spent more frustrated than not. We were staying in South Lambeth, which happened to be the area of a closed underground station. Transportation was difficult. Before we even got into the city, our first scheduled tour was cancelled. While the tours we ended up taking that day were nice, they were not as amazing as I believe our original tour would have been. The highlight of our first day was our Jack the Ripper tour in the evening, where we traced the footsteps of the infamous killer from one location of his killings to the next. Spending some quality time at London pubs helped us forget the mishaps of our first day. Due to transportation issues, we missed our Buckingham Palace tour. It was the first day of the year that the Palace was open to the public, and it was a huge let down. We marveled at the extravagance of Westminster Abbey (and the many, many tombs in one space). Our afternoon walking tour was dampened by a downpour, and we ended our time in London freezing, sipping afternoon tea. Our itinerary was created to see the most in two days. We picked which main sights were of the greatest interest to us and then looked for tours that could fit in as many of those as possible. Almost everything that we did was a main tourist attraction, and places were quite crowded and busy. We stayed at one Airbnb during our time in London, located in South Lambeth. It was a pub-turned-Airbnb that rented out multiple rooms. It was spacious, with our room having its own bathroom. If you sign up for Airbnb using this referral code you can get $26 CAD off of your first trip! We chose not to have a car in London, for practical reasons. It is a huge city to navigate and there are many other transit options. We were under the impression there was transit close by to our Airbnb, but unfortunately during our time there it was closed and under construction. This meant a lot of walking, and taking many of London’s famous “black cabs” from place to place (read about that disaster here). We rushed our meals, due to back to back tours and running late because of transportation issues. We ate at restaurants for every one of our meals in London, with the exception of breakfast on our last day that was provided by our Airbnb host. Both of these tours were replacement tours. 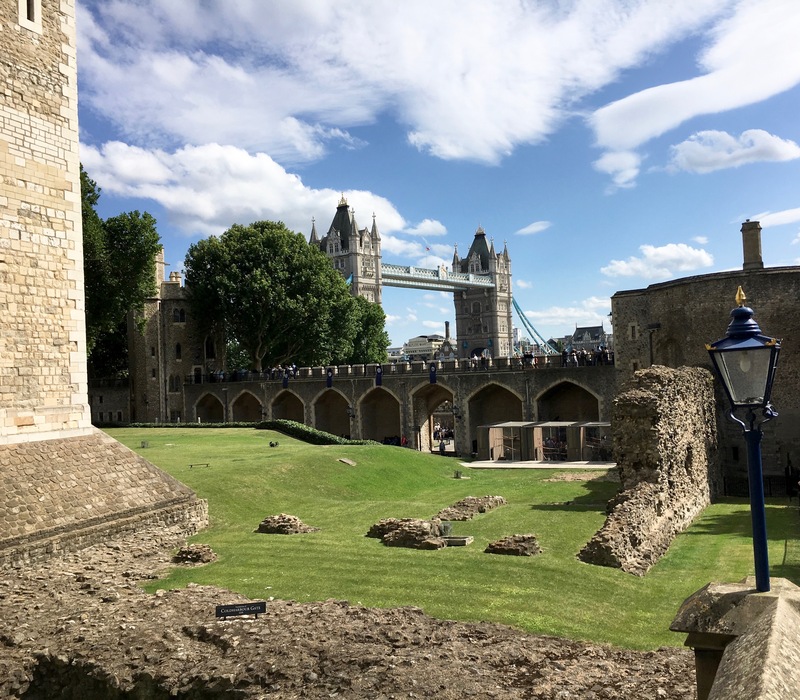 We originally booked the London In Style tour with Evan Evans, which would have taken us on a tour around London in a double decker bus, to Westminster Abbey where we would have lunchtime tea, in the afternoon to The Tower of London and then to Borough Market. The tour was cancelled due to low numbers. This was not on our list of top sights to see, but I am glad we got to see it! We had our tour guide come inside with us, and that helped us navigate immensely. Our guide told us stories of the architect, Sir Christopher Wren, and stories of the damage that occurred in WWII. Our guide showed us the entrance that Princess Diana had come in for her wedding, and showed us the crypt of Horatio Nelson, who was brought back to England from sea in a barrel of brandy. One downside is that you cannot take pictures within the Cathedral. This was the place I was most excited to see, and due to time constraints I did not get to see as much of it as I would have liked to. There are actually multiple towers, as well as England’s Crown Jewels. Our guide gave us a walking tour with a brief history, and led us to the Crown Jewels. After that we had some time to explore on our own. We stopped in at The White Tower, which was beautiful from the outside and filled with historical armor and weapons on the inside. When choosing replacement tours, my husband convinced me this was a good idea. I thought it was quite creepy. We tracked Jack the Ripper’s killings to their actual locations, and learned the story of the man who is probably the world’s most infamous uncaught killer. As we walked through alleys and down dodgy roads we saw signs of the area’s past hidden on old buildings and in the names of places. It was so cool! We ended off our tour eating fish & chips wrapped in fake newspaper!! Trafalgar Square; Breakfast, Lunch: This is a famous coffee shop chain in London, and we went there out of convenience. We had wraps that were okay, but had a hard time finding seating during busy parts of the day. Spitalfields; Dinner: This was our last stop on our Jack the Ripper tour, and was super yummy. There is nothing quite like eating fish & chips from fake newspaper, with a little fork. If you want to experience this old way of eating fish & chips Poppies is the place to go! Westminster; Drinks: After a crazy long day we decided to check out some of London’s pubs. One thing that was so interesting to us was that people drink outside of the pub, leaning up against window sills or trying to grab a table to stand around. The drinks here were very overpriced, but the atmosphere was totally worth it. In the morning we took a black cab to our tour meeting place, as it was a 40 minute walk from our accommodation. Our tour in the afternoon took us from place to place in a coach bus, which was comfy and air conditioned. From Tower of London we took a river cruise to Westminster Bridge, where we walked the rest of the way back to the meeting place of our next tour. Again we took a coach bus to Spitalfields, and walked around the area. After the tour we walked around London for the remainder of the night, and took a black cab back to our accommodation. We missed our City Wonders Buckingham Palace Tour, as we were 5 minutes late, and their policy was that we could not join them after they left the meeting point. I was very disappointed, as Buckingham Palace is only open to the public during a few months of the year, and this was the first day the public would have had entry. Another tour was offered to us and we chose a London walking tour. After missing our tour we decided to walk to Westminster Abbey and take a self guided tour. Armed with an audio guide, we spent an hour and a half tracking down famous tombs. We visited the Tudors, as well as some of British’s most important historical figures. It can get quite busy, and the entrance line is extremely long. This tour would have been lovely, if it had not been for the rain. We started in Trafalgar Square and walked through the history of Westminster. I was not dressed appropriately as it had been sunny all morning, and we got caught in a torrential downpour for the entirety of the walking tour. We spent most of our time huddled under doorways seeking shelter from the cold, wet rain. We had breakfast at our Airbnb, and had dinner at the train station on our way to Paris. Westminster; Lunch: We finished our walking tour with afternoon tea at a hotel. Pouring rain had dampened our walking tour, and I had to change my clothes before sitting down. The tea spread itself was yummy, with a combination of sweet and savory bites, as well as desserts. An early morning asthma attack meant we took a cab to our tour meeting point. Due to London traffic, we were late and missed our tour. We walked to Westminster Abbey, and then walked back to our rescheduled tour meeting place. After our walking tour we headed back to our accomodations to pick up our bags. We then traveled via buses and underground to get to St Pancras station. London was not at all what we had expected. We made a few mistakes: we chose an Airbnb quite far from the city centre, and we did not check transportation options. We also had a lot of unfortunate things happen: cancelled tours, asthma attacks, missed tours, lots of rain. Please feel free to use this itinerary as a rough guide, and take from it what you need. It is not a perfect itinerary, but has a lot of great ideas for first-timers. Sorry you had a some bumps on your trip, but it looks like you managed to have a good time anyway. I’d love to visit London someday. I did manage to have a great time! I am hoping to return and have a better time! You should! It is an amazing tour although a tad bit creepy! Yay! It’s showing up now. I am sorry to hear that your tours were cancelled! We had a fabulous time in London last summer. It was so amazing to see the crown jewels. I am so happy you had an awesome time, I have heard that from many, many people. I hope I get to go back and have a better experience! I feel like it is so hard to see a place in two days, but I’m glad there were still some fun highlights in addition to the frustration. I definitely need to visit London! SO hard! I thought it was doable before I got there but now I realize it is hard to see any city in that short amount of time! I hope I do as well. I know many people who also say London is their favorite city in the world! I’m sorry that parts were frustrating, but it sounds like it was still a fun trip!